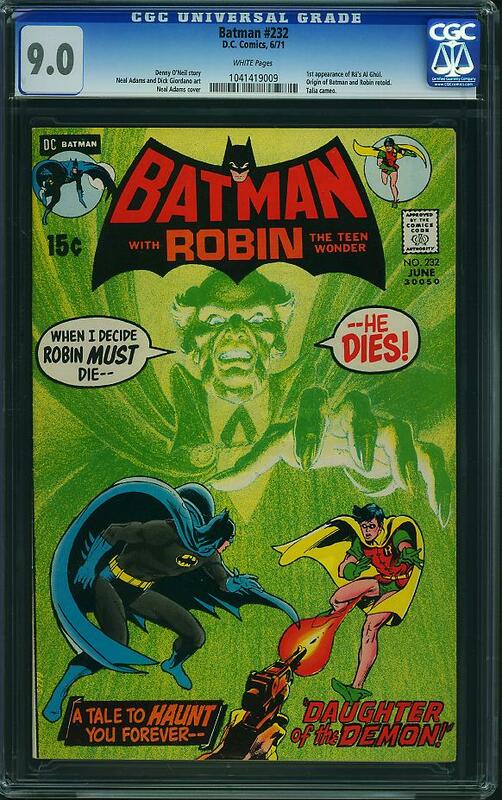 The comic book portion of ComicLink’s Fall Featured Auction ended Wednesday February 25th with some staggering results. The market is still hot! The big book of the auction turned out to be the CGC 9.6 Fantastic Four #5 that got $96,267.00. I’m not sure but I think I’d rather have the CGC 2.0 Superman #1 that got $81,222. I’m not a big Superman #1 fan but I like the result being more about the book and less about the grade. A Hulk #1 CGC 6.0 got almost twice as much as a Fantastic Four #1 at CGC 6.5. Only 3 Spidey books, his must be an historic low? OK let’s look at some results. 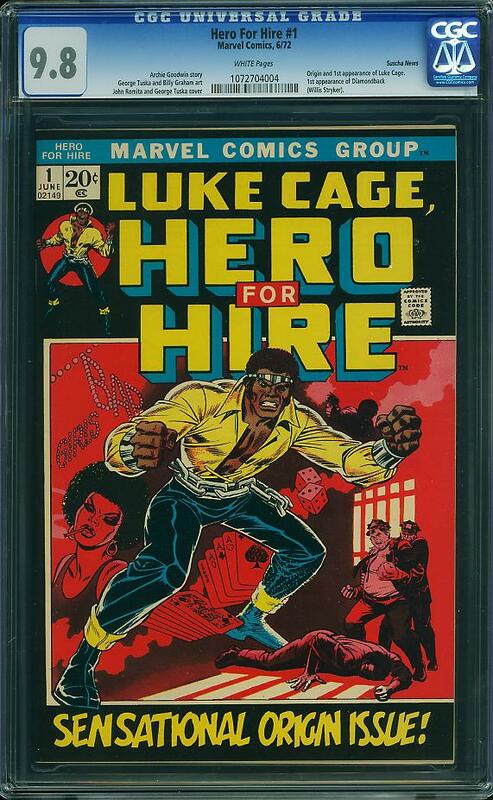 Hero For Hire #1, Marvel Comics (June 1972) Graded by CGC at 9.8 with White pages sold for $11,360.00. I have no idea when this book will stop. To me this is too much for grade. There are still a lot of copies of this book not graded; on top of that there are a heck of a lot of nice clean tight 9.6s available at a fraction of the price. We are seeing the utility of ownership working its influence on low grade prices basically pushing the prices of low grades up, perhaps we will start to see the utility of ownership keeping 9.8 prices down? Probably not. Aquaman #1, DC Comics, (February 1962) Graded by CGC at 9.4 with Off White pages sold for $11,360.00. Crazy money for this comic. I knew there was a lot of room for this book to shoot up and I expected it to approach 10K. It was a surprise to see it crack $10,000. Aquaman was not a major title. 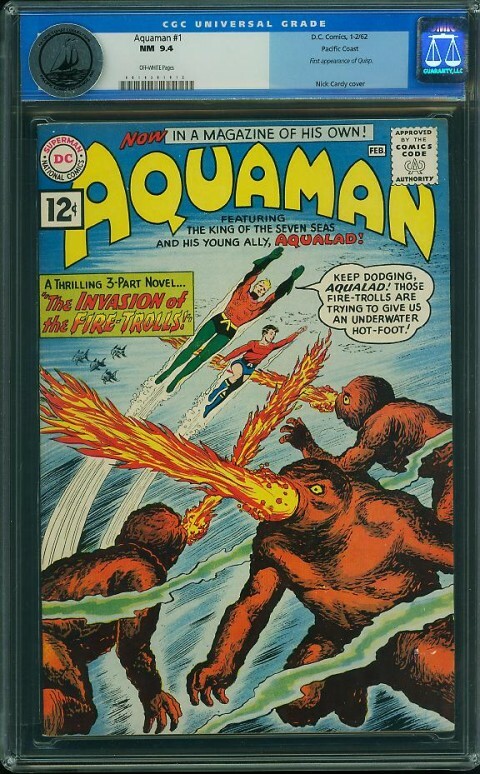 The character appeared first in the Golden Age (More Fun #73), then he was in Adventure Comics and the 4 Showcase Comics tryouts So I’m saying we might be giving Aquaman #1 a bit too much respect. 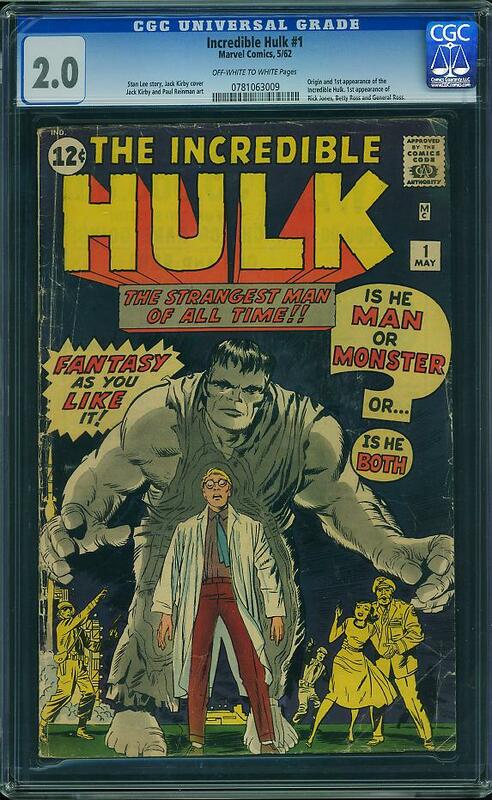 Incredible Hulk #1, Marvel Comics, (May 1962) Graded by CGC at 2.0 with Off White to White pages sold for $6405.00. Hard to believe that Hulk #1 at 2.0 is outperforming Amazing Fantasy #15. AF #15 it 2.0 is still trading below $6k. I do like this copy though, Hulk is a tough book and at the end of the day this is a good buy in to the party. 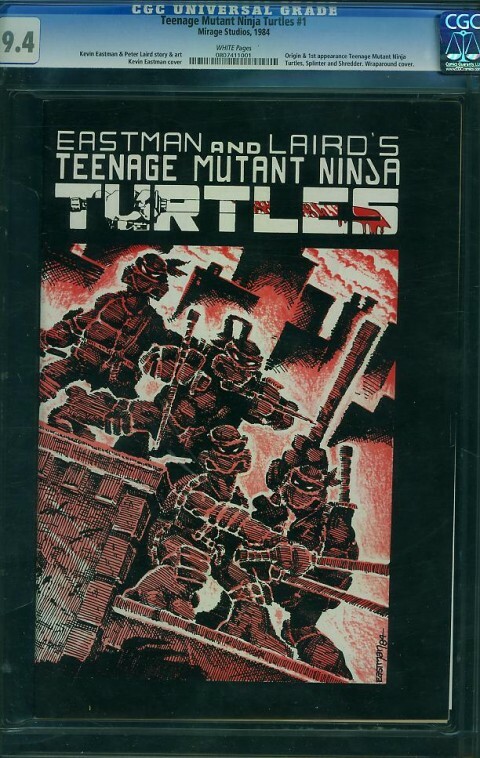 Teenage Mutant Ninja Turtles #1, Mirage, (1984) Graded by CGC at 9.4 with White pages sold for $4,863.00. The Turtles have been trending down for the last little while. The last 9.4 before this one got over $5,200 and the average before that was closer to $6k. What gives? Not sure. I do think the property has legs though and it is here to stay. Maybe we’re experiencing a trough like Hulk #181 at 9.8 and 9.6 experienced a couple of years back? I bid on this book, was trying to steal it for less than $4,500. 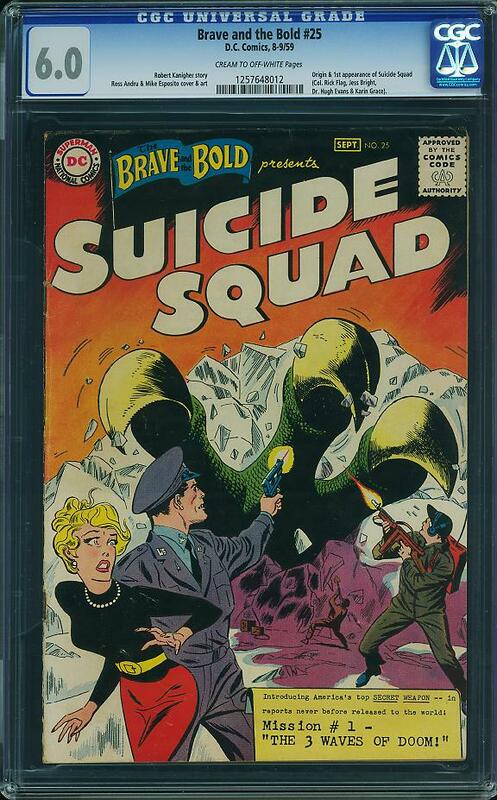 Brave and the Bold #25, DC Comics, (August/September 1959) Graded by CGC at 6.0 with Cream to Off-White pages sold for $2,500.00. So what do we do with these 1st appearances that are no longer really first appearances? This book features Suicide Squad, Marvel Superheroes #18 featured the Guardians of the Galaxy. Both books have been usurped by more modern books that introduced updated teams. These updated teams are the current pop culture darlings, movies are being made based on them. So back to my question, how much stock do we put into these original incarnations, they did introduce the premise after all. This one is close but I’m comparing 6.0s of great properties like Hawkeye, Black Widow, Wasp etc and this seems pricey. 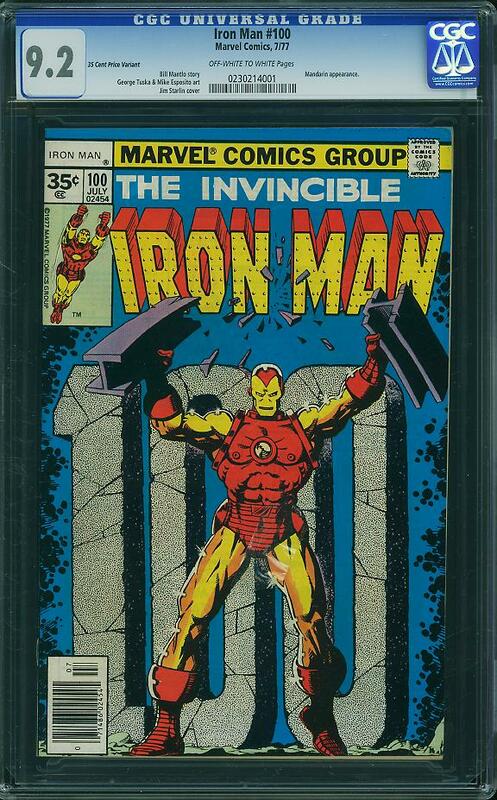 Iron Man #100, Marvel Comics, (July 1977) Graded by CGC at 9.2 with Off White to White pages sold for $1,200.00. 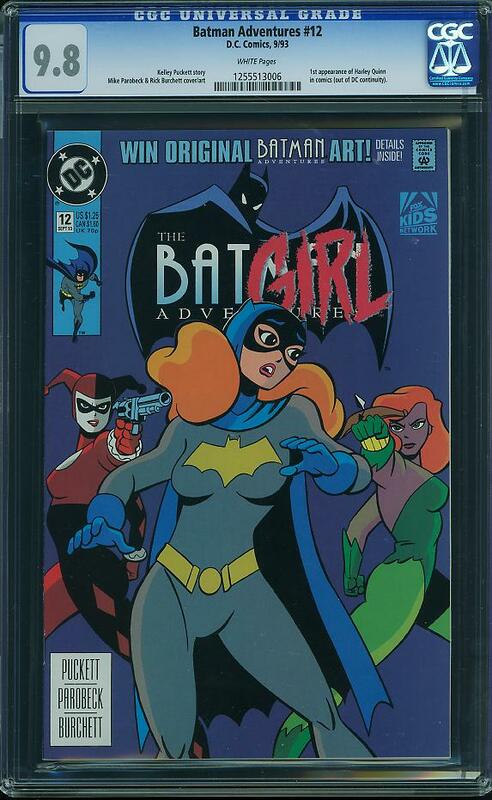 Batman Adventures, DC Comics, (September 1993) Graded by CGC at 9.8 with White pages sold for $1,555.00. Wow! This is a great price and an indicator of the amazing demand for this comic. The only reason I’m stubbornly against this book being worth so much money is that the property was a comic adaptations. i remember a US dealer (from outside Detroit) that had a Hulk #1 … this was back in 1992ish at the OCA comic conventions. he wanted $1000 for one that was near perfect. all the other dealers were laughing at his price. what a shame i wasn’t smart enough to buy it. The pop culture title wave continues to build up momentum. Walter, you said, “These updated teams are the current pop culture darlings, movies are being made based on them. So back to my question, how much stock do we put into these original incarnations, they did introduce the premise after all.” I suspect that that more stock will be placed in the updated teams. It is interesting watch the Bronze Age explosion of key issues, impacted partularly by Marvel / Disney movies or expected movies. Some CGC 9.8 eBay sales I have noticed in past months. Imagine Howard the Duck and Rocket Racoon bantering with each other in the next Guardians of the Galaxy movie? If so, watch Howard the Duck 1 and Fear 19 explode. Not many will agree with me that unexpected sleepers are Marvel Age 41 and Fumetti 1, both with large photos of Stan Lee on the cover. Hopefully Stan will be with us for years to come. Since the public views him as the Father of Marvel Comics, once he goes to join Oden in Asgard, we may see an understandable nostalgic interest in these photo cover issues. Marvel Age 41 is hard to find in high grade. We all have our Hulk #1 stories Nestor, lets focus on the positive and reminisce on all those pick ups we scored big on!! Good insights Peter, now its time to act on them!! i’ve learned my lesson Walt. just buy good quality, key gold and silver age books, and never sell. At this rate, can you imagine what these books will be worth in 2020? Lets keep it going guys… and see how high can we stack these cards? what has been steady going up and up after almost 100 years of collecting kiddies? yes, GA and EARLY SA. Save the rest in retirement for more absorbent tissue and towels. it’s hard to beat good quality gold and silver age comics. if have $1500 to spend, there are a whole bunch of books i’d rather buy than a first Harley Quinn..
Stephen – History supports your premise. Yet, note for example that pop culture interest in westerns has declined dramatically and with it the value of GA & SA western comics. The blockbuster movies, games, cartoons etc are shifting to more of a modern hero and team paradign. This will NOT likely diminish blue-chip vintage comic values (in some cases they will be enhanced where heros continue to be relevant). However, I think we will see some values shifting. For example, if Ms Marvel is a hit movie, her first Bronze Age appearance will keep climbing. What many of us might have a hard time facing is that new permanent collectors are entering the market, drawn in from movies, games, childhood cartoons, etc., yet who have never been comic book readers. Their investments are shifting the market, even if slightly now, but their impact is growing. TMNT #1 is an 80s era book but it has the scarcity of a much older book. I think the TMNTs have well and truely proven, by now, that they have the longevity (they’ll never die!) so that price is a steal. A great pick up. I followed this auction pretty closely. As much as I am of the older generation, I recognize that you shouldn’t fight the tide. A number of the “Advantage Seller” calls are based on “fundamentals” arguments that make a lot of sense if you have been in the game for a long time and see the movies/TV as derivative, but if you are coming from the other direction these books are the “old” “rare” genesis of the “actual” product (i.e. the movies/TV). I have a hard time putting myself in that mindset but I think you have to accept it as a major price driver. Every title noted above is hooked into the movie/TV machine. While this might cause seemingly ridiculous prices (Luke Cage – he doesn’t even have a real costume! – and 1972!!! ), we just have to accept that this is now the mountain that the rest of the hobby is now built on, and enjoy the ride rather than wishing it were otherwise. If it becomes otherwise, it is going to be much worse for everybody. I see the bidders for these what appear to be marginal books to be helping “the old guard” by pouring in money that flows back into more unfortunately neglected areas (say Golden Age), and by raising more interest in the hobby/investment through the repeated record-breaking prices. If we can keep this going even funny animals might have a chance. I grudgingly buy Charlie Kim’s thoughts on BA 12. As has been pointed out elsewhere, for various reasons there probably are scads of ungraded high grade copies lying around out there (unlike Spider-Man 300, which never ceases to mystify me). I have resisted BA 12 but if I am going to get into something recent and fashionable, this is it. I bought two fairly low-end Marvel Mysterys in this auction. I don’t have the money to chase new records. Action 242 3.0 with “brittle” pages? I really want this book but I won’t buy brittle – I’m afraid I might end up with a package of dust in a few years. Was it a buy at ~$800? Big All-American Comic Book 1 9.4 (single highest) – 11.5k vs. 18.2k just 18 months ago. That hurt. When I saw where this was going I almost bid, but I didn’t have the stones. Is this the right price or was it a tremendous bargain? Is this really the same as Luke Cage #1? Captain America 9.8s selling for upwards of 1k – what gives? Is this “true” collectors, “new” collectors who just collect grade, or speculators who would buy an empty case with a 9.8 on it? How many EC buyers are EC collectors versus people who think EC books always sell at high prices? I can see the attraction of some of the more classic/brutal covers, but otherwise there’s no emotional tie (say like Luke Cage’s hard-luck story). New Mutants 98 9.8 for $800, relatively high. For me, BA 12 9.6 for $800 versus this is a no-brainer – agreed? Showcase 22 5.5 2.5k – is this really the level, or are we still suffering from bad movie overhang? In terms of scarcity and character importance this strikes me as incredibly undervalued. Superman 76 9.4 13k – Advantage who? Typo: on BA 12, I meant to say there probably _are not_ scads of ungraded high grade copies. The only reason Ms Marvel is climbing is because people are hording them. People are hording them because they believe it’s worth money. It will always be worth money as long as there are people willing to pay for it. I’ll be 46 in few short months. I figure I’ve got a good 20 years **taps head** before I my final rest. How old are you guys? Welcome back Stephen. Where you’ve been? In other words… these “hot” bronze age books are a self-fulfilling prophecy. Nothing rare or notable about them but valuable because collectors believe it so. I agree, but you wont double your money on Avengers 2. Think of all the weed and booze you can buy with an extra $1500! Hi Nestor, for this generation, Harley Quinn may be the new Superman, Batman or Spiderman. I compare this to baseball cards which I used to collect. Ask a 12 year old about Reggie Jackson, Hank Aaron and Mickey Mantle and they don’t know. Those cards would go up according to the year the player had, if they got inducted into the HOF or if they passed away. Those cards that used to be collected and traded can now be had for next to nothing. The only ones that hold their value are mint condition cards. Maybe some of these superheros popularity will wane in 10,20,50 years? Charlie, I’m right behind you. I think you probably have more than 20 years left. As for my Ms. Marvel, I dumped mine a month ago, I was never a fan so it wasn’t meaningful to me. It seems like a lot have been getting sold so I don’t know who is hoarding these unless people still think it’s going to peak and are trying to time the sale of these issues. maybe, maybe not. i’m interested in holding good books for a long time. like my copies of batman 181, or detective 298, or asm 50, etc, etc… all in high grade, each for under $50, many many moons ago. who knows what an avengers #1 or 2 will sell for in 10 years. or any of the above. as for doubling my money, i do that with stock options, like the mcd 15Jan16 110C this week. easy money. i don’t waste it on weed and booze..
Ed, sure. Harley Quinn may end up a huge book in time. i have no way of telling. maybe first Luke Cage above will still be worth that money… no idea. but i do know that Avengers, SpiderMan, FF, Superman, Batman.. they have staying power. if i buy a good quality key issue in the established heroes, i’m pretty sure in 10 years i’ll be able to get my money out. will i have made a huge profit? don’t know. depends on how good i can buy, and what the market is like when i sell. the books i’m looking for right now are still under the radar imo. they tend to be harder to find key issues. or simply quality golden age books that i believe are better value than some of the current hyped books. i have no idea if superman or batman or spiderman will still be popular for 50 more years, or Harley Quinn or something else will take over. There are many different strains, methods or reasons for collecting. I have my small pile of SA keys, my Byrne X-Men and Miller DD runs which I wont sell any time soon. But I also hold several copies of NM#98 and I’m just waiting for the right time to release them into the market. I would also drop $1500 on BA#12 in a heart beat, knowing that this book is on a tear… and plan to let it go in a timely manner. Some bucks towards a fine Scotch is not wasted money. – In my opinion! funny story Walt. i met a couple of kids in Cuba years ago. they were from Slovenia, on a month long trip through Cuba.. i taught them about Cuban cigars and rum. they showed me what drinking was all about…. imagine going to Cuba, and bringing your own home made schnapps, in case you couldn’t find anything to drink while in Cuba. luckily, i benefited, and was gifted a couple of bottles, and made life long friends. hi guys,thanks for asking Charlie…well it’s been quite a ride. Drafted out of School of Visual Arts and wound up like 1000’s of other young men on that Operation depicted in Oliver’s “Platoon”.Coping with this Ptsd ain’t no picnic Yeah, what you see in that film i went thu. Anyway, the S.H.’ Will always be with us. And Westerns too, but all the other Genres will share within The Pantheon as time goes by. Peace. what if the ms Matvel movie is a flop, and interest in harley quinn goes downhill? “brittle pages” ?? don’t touch it… i won’t go for anything with cream pages either. as for the All-American Comic Book,.. guide price is far too high… i’ve seen them go for half guide. Platoon was a great movie but I sure as heck wouldn’t want to live it. I guess all we can do is deal with things as they come and take things one day at a time. My personal belief is that Comics will continue to go up as long as the interest rates stay low but watch out once they start going up a few times!